I had wanted to go to “dinner” by Heston for a while but knowing the show and standards of Heston’s other restaurants, I wanted to go for an occasion. For my birthday, two of us went to Dinner for a taste treat of epic proportions. Set in the Mandarin Oriental hotel just off Hyde Park, the decor is inspired by 15th/16th Century cooking. This apparently was down to Hestons intrigue over the era(s). What does that mean exactly? Good question. We also had the Roast Marrowbone with Snails, parsley, anchovy, mace & pickled vegetables. Woof. This was seriously good. Even if you usually recoil at the thought of snails, I would highly recommend that you try this… and then perhaps have a talk with yourself about getting on board with snails. Also, the Savoury Porridge of Roast cod palette, smoked beetroot, garlic, parsley & fennel. (I know what you’re thinking.. 3 dishes…. there were only two of you… judgy judgy). For mains, we had the Spiced Pigeon with Ale & artichokes and the Hereford Ribeye with Mushroom ketchup & triple cooked chips. The pigeon was obviously perfectly cooked and had a really unexpected spice that you wouldn’t usually expect with Pigeon (from the mace). The ribeye was cooked to perfection for my dining partners taste and was incredibly full of flavour. (As an off tangent side note, I would choose Rib-eye over a Fillet any day of the week…). As you know, my mention of dessert is usually brief, but then usually they aren’t being served to you on a portable ice-cream cart with enough nitrus oxide to rival the look of a time machine. Their signature is the Tipsy Cake with Spit roast pineapple but I have never been one to follow suit so watched on as other diners tried it… They all seemed to be incredibly pleased. Being of an incredible standard of both cooking and invention, the place is… well frankly exciting. People are intrigued and wowed and like kids in a very big and lavish sweet shop (If this leads you to expect food for 1p, you will be mistaken). Everyone is experiencing new things and unexpected treats at the same time and so there is a bit of a collective excitement in the air. My Advice? 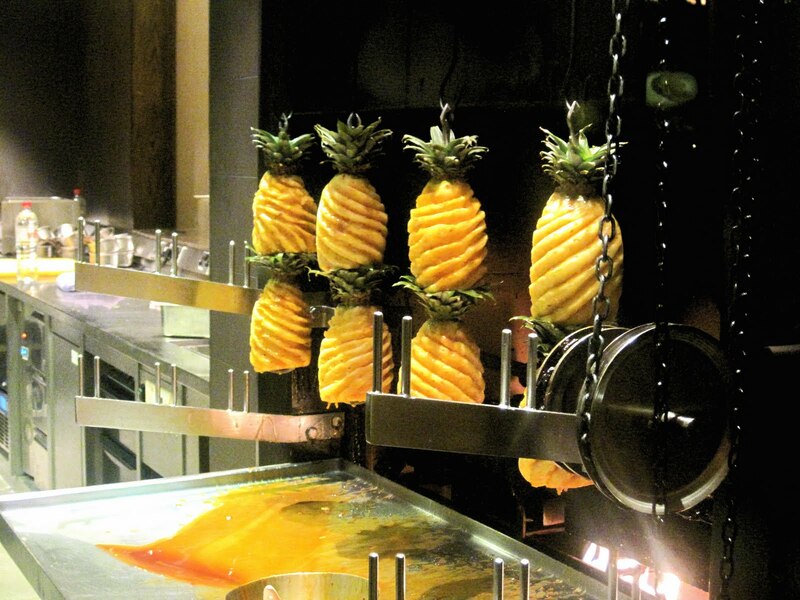 You should have stopped reading this at “Mandarin Meat Fruit” and headed out to Knightsbridge….